Brand new Insiders Report – Hot off the Press! Hard to believe it but Saturday sees the final day of the 2018 turf season with the traditional end of campaign meeting at Doncaster which features the Marathonbet November Handicap. That particular race was amongst those covered by Big Race Specialist Nick Hardman for the Betting Insiders Club monthly Members Report and a little later on we will be sharing Nick’s final selections for this very competitive Class 2 Handicap. Just before we move on to those we have a quick update regarding the Club’s latest activities. The brand new Members Report is hot off the press and this time around the 52 page report kicks off with Nick’s regular piece providing the key stats for a selection of big races due to take place in the coming weeks. We have Chutney Dave’s review of the key performances from the recent Cheltenham Showcase meeting whilst Alan Dudman (betting.betfair) has a raft of in-running pointers for those that enjoy backing and laying on the exchanges. There are also plenty of suggested punts on the feature NH races including a strong long range fancy for the King George at Kempton on Boxing Day. The racing content continues with a really comprehensive Jumps Season Fact’s collation whilst Gary Boswell completes his “It’s Time to Tell” fable. We also welcome back “Research Corner” which this time around contains a micro method of a trio of trainers that will hopefully be a source of profits over the winter months. So far there have been 2 winners from the first 5 qualifiers and another couple were mugged after going long odds on in-running! The line-up this time around completes with further La Liga insights from our “Man in Spain”, a preview of the 2018/19 US PGA Golf tour along with more risk free betting techniques from our Arb Guru and finally the latest findings, including one or two gems, from the hard working Testing Team. We firmly believe that this latest report is both an enjoyable read and one that will provide plenty of thought provoking insights to help continue the on-going battle with those pesky bookmakers and the sharp minds on the exchanges. 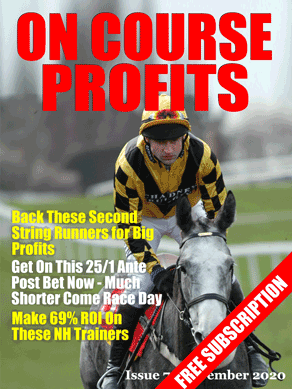 The monthly reports form an integral part of the 3 pronged comprehensive package available to Insiders Club members so if your current punting activities are not delivering the level of returns that you would hope for then now is the perfect time to make a change for the better by finding out more here. One from the Insiders Report and we have 4 trends qualifiers.